The BDS Movement advocates the boycott, divestment, and sanctioning of Israel. It has found the most success in university . Its campaign has organized demonstrations and protests targeting companies that have contracts with the Israeli military or with companies in Israeli settlements.Its Actions may also target prominent individuals who openly support settlements businesses. 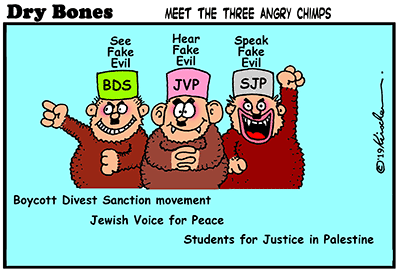 Jewish Voice for Peace was formed in September 1996. It endorses neither a one-state solution to resolving the Israeli-Palestinian conflict, nor a two-state solution".It supports the Palestinian right of return while opposing the Law of Return and Jewish immigration to Israel and the Birthright Israel movement. Students for Justice in Palestine was first established at the University of California, Berkeley in 1993. SJP is known for intimidation of Jewish students. In 2001 the group organized the first Palestine Solidarity Movement (PSM) conference to coordinate corporate divestment from Israel efforts nationwide. * * * Dry Bones needs your support.